Friday Wrap-Up – News and New Beers from BarNone, Rockbottom, Picaroons, Hammond River, PEI Brewing, Red Rover and more! • A couple of weeks ago, we alluded to a new beer being released by BarNone Brewing, and we now have some more details. An American Pale Ale, the beer was brewed in collaboration with Bicycle Craft Brewery, a new brewery opening soon in Ottawa. Owned by husband and wife team Fariborz and Laura Behzadi, they came in contact with BarNone brewer/co-owner Don Campbell when they ordered their brewhouse through DME, which constructed a similar setup to what BarNone brews on. When Don invited Fariborz and Laura to do a test brew on his system, so they’d be familiar with the setup, Fariborz designed a recipe and sent it Don’s way. A few minor changes were made due to ingredient availability, and then the three met at BarNone to brew the beer. Broke Spoke Pale Ale was born! A Pale Ale with a “good amount of malt backbone, so that it balances the hop bittermess”, the beer still has a good amount of hop flavors and aromas coming through. Broke Spoke made its debut last night at BarNone’s weekly growler night; it may pop up on tap at bars/restaurants across the Island in the near future. • Tickets are now on sale for this month’s Beer Dinner (Tuesday, June 24th at 6:00 pm) at the Rockbottom Brewpub in Halifax. There are only 30 spots available; each ticket sells for $35, which includes three courses paired with beer. This month’s dinner consists of a pork belly slider paired with their Intergalactic SMaSH’d Lager, beer-marinated, grilled Cornish hen (with newly-tapped Hali-Lager), and a black pepper & strawberry shortcake (Jacktar Stout). You can reserve tickets by calling the brewpub (902-423-2938); act quickly, they usually sell out fast. • While on the topic of Rockbottom, if you haven’t had a chance to try Wreckoning RIS – their Russian Imperial Stout that recently won Atlantic Canada’s only gold medal at the 2014 Canadian Brewing Awards – or just want to try it again, they will be pouring the beer next Wednesday, June 11th at 4:00 pm. Get in and get some while you can! • Also, if you’re anxious to start having lunch at the Rockbottom again (or starting your pub crawl a little earlier), they’ve announced that they’re now open on weekdays starting at noon, with a good possibility of opening at noon on weekends as well, later in the month. • The 2nd Annual Fredericton Beer Run is being held this summer on Monday, August 4th (New Brunswick Day). Like last year, the event involves a run along Fredericton trails starting at noon, followed by lots of beer! Registration begins at 11 am; participants can choose to run either a 6 or 12 km route. Tickets are $50 and can be purchased online; they include a custom-designed running bib and beer stein, water stops, and 14 beer tickets. Each beer ticket is good for a 4 oz sample of beer or cider, with at least 20 different beers/ciders available to sample; this part of the event will be held at the Delta Fredericton). New Brunswick breweries Big Axe, Grimross, Moosehead, Pump House, Railcar, Red Rover, and Shiretown will be pouring; Unibroue and McClelland Premium Imports will also have some beers to sample. • We hope you’ve purchased your tickets to Picaroons‘ 2nd Annual Brewer’s Bash on Saturday, July 12th in Fredericton, because they’re now officially sold out! Even with an extra 500 tickets being sold this year, they still went very quickly. They’ve also announced the three musical acts that will be playing throughout the day-long event: Zeus, Cyndi Cain, and The Chronos Band. We’ll keep you posted on the breweries that will be attending as the Bash gets closer. And a reminder: they’re still looking for volunteers if you’d like to attend – 4 hours of helping out will allow you 8 free hours to enjoy the festival, so send them an email if you’re interested! • And speaking of Picaroons, they’ve picked the winning cat for their Melonhead bottle label… the lucky kitty is Ruby, who was entered in the contest by her owner, Madison Sagle. Melonhead is now on tap at the Brewtique, and should be popping up at restaurants and bars in the area, as well as in bottles, over the next couple of weeks. • The new Imperial IPA from Hammond River, Too Hop to Handle, that we mentioned last month has been kegged and is awaiting ANBL approval, which means it should be on tap in Saint John soon. Brewed almost exclusively with the Zythos hop, we’re looking forward to a fruity and piney hop bomb! • PEI Brewing Co. has a new beer on tap exclusively at the brewery at 96 Kensington Road in Charlottetown. While currently unnamed, the beer is a Light Lager (4% ABV) that has a low bitterness (8 IBUs) from Kohatu, a New Zealand hop variety. The beer was then “highly dry-hopped” with another NZ variety, Motueka, giving the beer a “tropical and piney” aroma, according to the brewery. Sounds like an interesting cross between a Light Lager and IPA… better get to the brewery to give it a try! • North Brewing in Halifax has released a new seasonal, their Summer Saison. Changed slightly from their standard Saison, it features coriander and orange peel in the beer, to enhance the already vibrant and spritzy character of the base beer. Both ingredients shine through in the aroma as well, complemented by the hop characteristic and yeast spiciness. It weighs in at 5.5%ABV, and is available at the brewery and Alderney Landing Market (Saturday only) in growlers, and on tap around Halifax and Dartmouth, and in Lunenburg at The Grand Banker. When the weather turns colder (let’s hope that’s 6 months from now! ), they have plans of switching up the recipe to a Winter Saison, featuring ginger and black pepper. • In more new beer news, Shiretown just announced today that they have a new beer available for growler fills at the brewery. All we know right now is that it’s an IPA, and is called Hops on for Nowhere. We’ll have more info on this beer for you next week! • If you’re living in the Sackville area, and are into craft cider, good news! Red Rover Brewing now has their Summer Brew on tap at Ducky’s Bar. Summer is a dry cider, described by Red Rover as a sharp, tangy thirst-quencher; it comes in at 7% ABV. Look for Red Rover’s other two regular releases, Spring Brew and Fall Brew, to follow after the Summer keg has kicked. • Ducky’s also announced yesterday that they have the new Big Axe summer seasonal, Simon Saaz Summer Ale, on tap. Check out last week’s post for more info on this beer. To follow, they’ll be tapping another Big Axe seasonal, White Birch Porter. A 6.5% ABV Porter brewed with pure white birch sap, owner/brewer Peter Cole describes the beer as dark brown in color, and medium-bodied. Slightly smoky, with an aroma of “dark roasted nuts, rye bread and chocolate”, the bitterness of the birch sap “complements the noble hops nicely”. • Yellowbelly Brewpub is releasing a new brew this weekend. Downtown Brown is an American-style Brown Ale, weighing in at 6.2% ABV and 40 IBUs. The grain bill consists of Canadian Pale, English Maris Otter, Canadian Munich, Scottish Carastan and Scottish Black Malt… a truly international bunch! The beer is hopped in the boil with Nugget and Galena, and then dry-hopped with Chinook and Ahtanum, and then with Topaz. A great blending of the chocolate, caramel, and roast from the grain, spice, herbal, pine and tropical fruit from the hops, will make this a great brew. • A reminder that the 2014 Newfoundland Liquor Commission Beer Expo is happening at the St. John’s Convention Centre this weekend. Box Office tickets are sold out, however there are lots available online as people’s plans change. For those unable to attend, or want to grab some of their favourites after the fest, check out this thread on the Beerthief forum for a list of special Festival beers that will be showing up at your local NLC this weekend. Cheers! • If you can’t be on The Rock this weekend, then be sure to make it out to one of the local bars in your area. If you’re in the Annapolis Valley, be sure to drop by the Library Pub in Wolfville tonight, and the Spitfire Arms in Windsor tomorrow, to help celebrate the launch of Schoolhouse Brewery. In Halifax? Drop by Stillwell at noon Saturday to grab a pint of Meander River‘s Lunchbox Pale Ale. For those of you who haven’t had a chance to grab some from the source in Ashdale, it’s definitely worth picking up! • Garrison Brewing is hiring: a full-time, permanent Brewery Sales Rep and a Seasonal Events & Sales Rep (full-time until September, possible part-time after), send off your resumes today! And even though the noon First Sips (aka Early Bird) tickets for their Cask Takeover June 21 at Stillwell are sold out, there will be lots of beer still flowing once the doors re-open at 2pm that afternoon, so be sure to drop by. We’ll have some more details on the casks available this coming week, but we got word of another one: their popular Peanut Butter & Jelly blend (Nut Brown and Raspberry Wheat), with raspberries from Noggins Corner right in the cask. This past weekend, the city of Fredericton welcomed the 12th Annual Canadian Brewing Awards and Conference to its fair city. Over the course of three days, attendees took in some excellent presentations, manufacturer and supplier displays, lots of social events, and of course the Awards Gala. We were fortunate enough to be in attendance, and wanted to share our great experience with you. The weekend kicked off with a Welcome Bonfire along the Saint John River. It was a great time for folks to meet and greet after arriving to town. Attendees had traveled from across the country, so it was a great chance to stretch their legs while enjoying the beautiful weather and surroundings. A couple of kegs of Picaroons were poured while folks enjoyed some slider-sized burgers and live music around the fire. The Friday morning sessions started early for many, after having enjoyed the city’s great bars (shout out to King Street Ale House and Brewbakers, where many of the visiting brewers seemed to congregate each night). 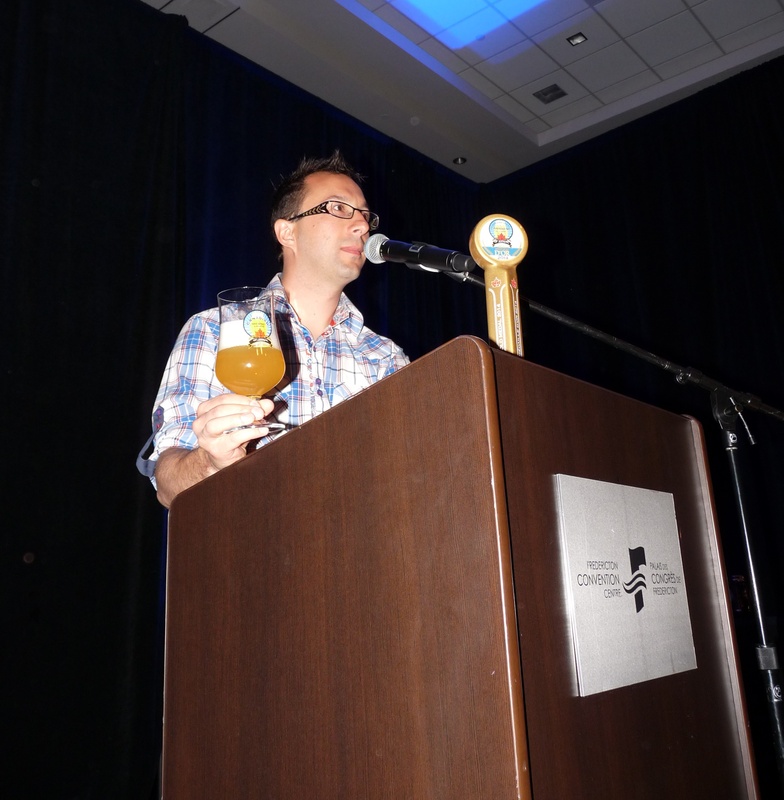 Tony Formby of 2×4 Brewing & Imports gave a talk on exporting Canadian craft beer to the U.S. He spoke of dealing with the three-tier system, and the economics that that entails. From our perspective, while (or perhaps, because) the U.S. is a huge market, it can be difficult to break into, and does not seem to be lucrative for most breweries to send their beer south, at least not until they’ve reached plateaued sales in Canada. The next session was from hop farmer Laurie Thatcher-Craig of Clear Valley Hops. She spoke of the history of small hop farming, especially in the Northeast U.S. Did you know that in 1849, New York state was the largest hop producer in the US? She also described the results of experiments with later harvesting of hops, allowing them to mature further on the bine. When waiting 3 weeks after the AgCan suggested harvest date, she was able to increase oil and alpha acid content by more than 50%, as well as change the aromatic characteristics of the hops to a more orange-like characteristic. The waiting period is not without perils: after the very short ideal harvest window, an oniony character can come through, negating most benefits of the delay period. For those unable to attend, the talks were recorded, and should be available soon on the CBA homepage. Also look there for “Live From the Green Room” interviews, where Rob Engman interviewed several people in the brewing community. Between the sessions, the Expo Floor was open, with about 20 exhibitors from across the brewing-related world in attendance. Models, videos and literature were available on all beer-related topics, including excise-bond insurance, brewhouse hardware, malt and hops, packaging, glassware and tap handles. From nation-wide to nano, breweries of all sizes benefited from chatting with the companies whose purpose is to make brewing and selling beer an easier task. Lots of connections were made, and we even saw a brewpump being walked down the hallway, bought at a particularily attractive fest-only price. 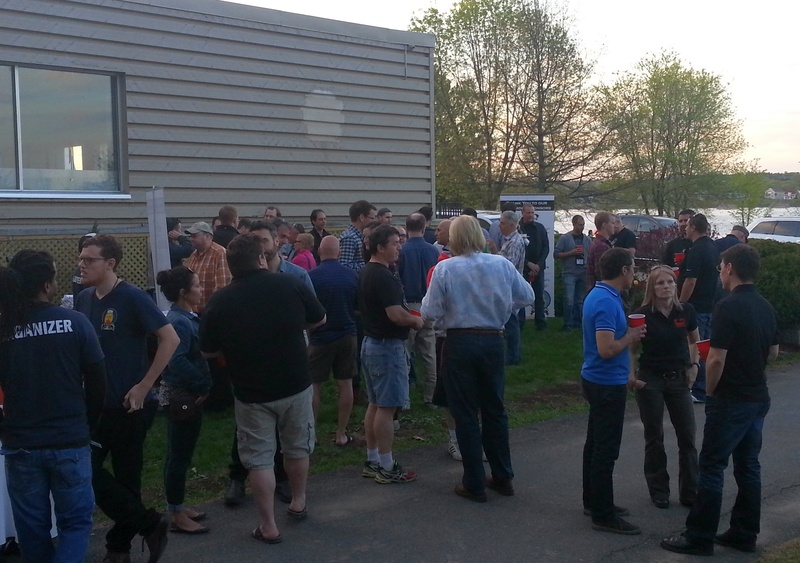 Friday evening, Picaroons hosted a lobster boil at their new location (opening in 2015), at the former site of the Gibson Roundhouse, located on the Northside of the river, adjacent to the Bill Thorpe Walking Bridge. Featuring a ton of great food from local producers, and music from local band Dub Antenna, it was also the first chance that outside brewers had to share any beer they may have brought with them for the weekend. And share they did! From all across the country, bottles, cans, and kegs of stout, pilsner, IPAs and wheat beer were enjoyed, and this social lubricant fueled discussions long into the night. The Saturday sessions started with a talk on Enterprise Resource Planning (ERP) software trends in the brewing industry, by Milan Jelaca of Deltasco. ERP software allows one to dig into the minutiae of the production costs and sales income of the brewery, as well as resource (both human and material) managements. The current costs of these types of software are definitely outside most brewery’s budgets, but the talk did bring to the forefront that it is important to keep detailed records of every step of the process, to track trends and act accordingly. The afternoon session was the Keynote address by Moosehead CFO Patrick Oland. He shared a history of the Moosehead Brewery and the six generations of the Oland family who own it. The brewery has recently undergone some expansions and improvements to the canning and bottling line, and is now capable of producing one million hectolitres of beer annually. Patrick also answered some questions regarding his company’s alliance with The Beer Store, despite the trouble smaller breweries have getting their beer on its “shelves”. Finally, Patrick let local beer fans know that there are no plans to expand Moosehead’s offerings of packaged products, including the cask beer that is available weekly at the Saint John Ale House, or the ales that were available at the Fredericton Craft Beer Festival earlier this year. 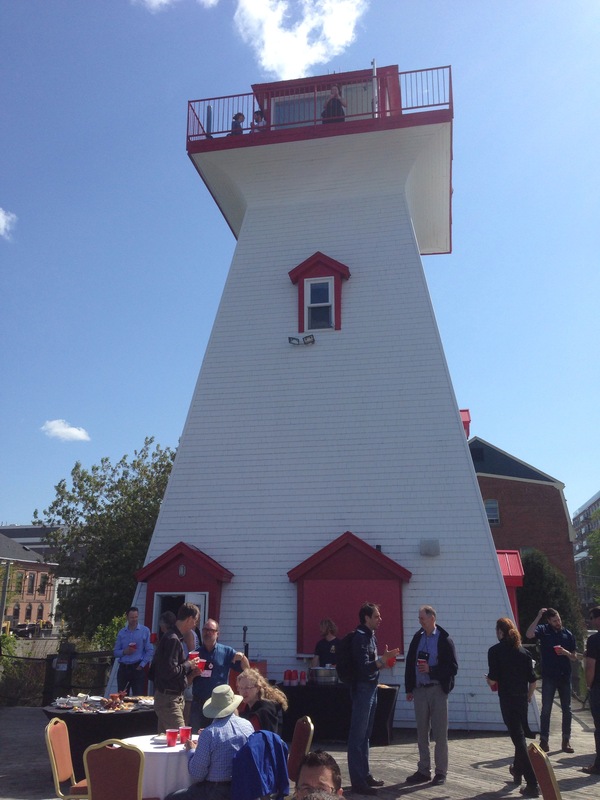 After the keynote, the Lighthouse on the Green was the site of another chance to unwind and meet informally with members of the Canadian brewing community, at a location with beautiful views of the river. We also understand there was a meeting between the brewers in attendance on establishing an Atlantic Canadian Brewing Association, not unlike the newly launched Nova Scotia Craft Brewers Association, or Ontario Craft Brewers group. If there are any updates on this front, we’ll be sure to share them! The medals were flying off the stage quickly, and by the end of it, five Atlantic Canadian Breweries went home with some hardware: Quidi Vidi Brewing Co. won silver for their Premium Lager (North American Style Lager), and bronze for their Iceberg Beer (North American Style Premium Lager); Picaroons Brewing Co. won bronze for their Blonde Ale (North American Style Blonde/Golden Ale); PEI Brewing Co. won bronze for their Sir John A Honey Wheat Ale (Wheat Beer – North American Style); Rockbottom Brewpub won the region’s only gold with their Wreckoning RIS (Imperial Stout); Boxing Rock Brewing Co. won bronze for their The Vicar’s Cross Double IPA (Imperial India Pale Ale). 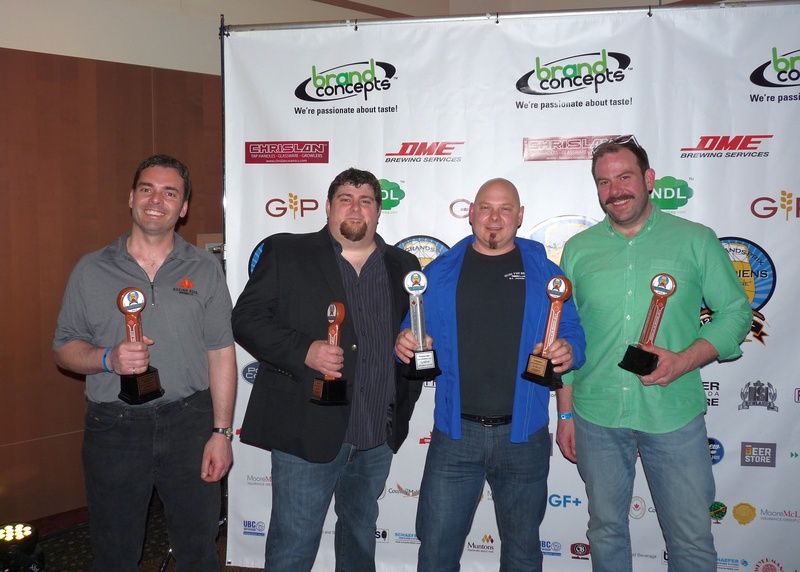 Our sincere congratulations to all of the winners, and well done to Great Lakes Brewery who repeated as Brewery of the Year (full winner’s list available here). For those of you not in attendance, check out the streaming link. Perhaps the most important part of the CBAs is meeting and talking with fellow members of the Canadian craft beer community. We really enjoyed seeing again (or meeting in person for the first time) our friends in the brewing world from Atlantic Canada and beyond; and for brewers, it was great to catch up and learn of successes across the region and country, what was working (or not) for breweries, and how that could apply for existing, new, or upcoming breweries. Thanks to Rob Engman and Kristina Santone for giving us the privilege to attend, and a special thanks to the many crew members and volunteers we ran into over the weekend. Without your help, it wouldn’t have been such a memorable time! We hope to see you all in Niagara-on-the-Lake, ON next year!